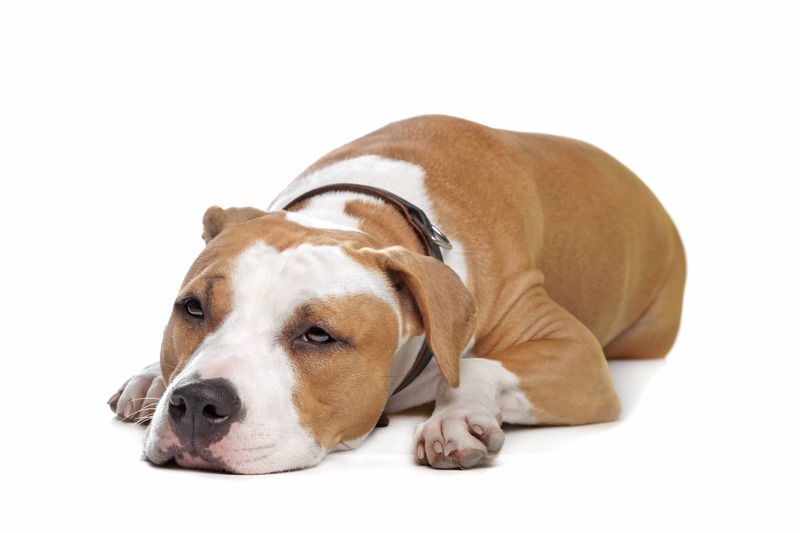 Does Your Dog Need Arthritis Medication? It Might Surprise You! Arthritis Meds for Dogs – What You Need to Know! Unfortunately, arthritis is very common in dogs. Approximately 1 out of every 5 dogs suffers from Osteoarthritis (OA), which is a type of degenerative joint disease, at some point in their life. This leaves a significant amount of pet owners asking “What can I give my dog for arthritis?” There are generally two types of assistance for dogs with arthritis (three if you include external supports like braces for dogs) – supplements and medications. What Is Flexpet & How Can It Help? Arthritis medication would typically refer to products that are prescribed by a vet such as Tramadol and Prednisone, though some products like aspirin would fall into this category as well (For extensive information on Aspirin for dogs, including dosage and concerns, please see Aspirin for Dogs – Is it Safe?). Unfortunately, the way that medications for pain typically work is that they basically cover up pain and symptoms as opposed to treating the root of the problem. For example, Ibuprofen works by “blocking the production of prostaglandins, substances that the body releases in response to illness and injury. Prostaglandins cause pain and swelling, or inflammation” (source). In other words, they block natural reactions to stop you from feeling pain. They also are typically only about 20% effective in dealing with pain. Previcox is okay to use for a few days (short term). Not for a week or more. There are both medications and supplements that are available over the counter to help your dog with arthritis. While Aspirin is over the counter, and can be effective as a very temporary measure, we do not recommend it for arthritis because of the long-term effects and the significant danger it can include (please see Aspirin for Dogs – Is it Safe?). 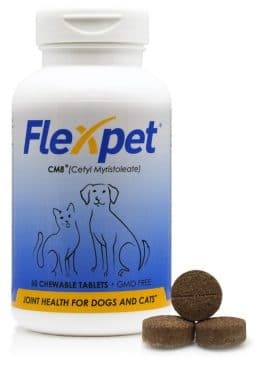 As far as an all-natural supplement, Flexpet is highly recommended because it is all-natural, available over the counter, does not interfere with existing medications, and contains ingredients such as CM8 (more info on CM8 here) that are not found in any other product. These foods are best to avoid if your dog has arthritis because they can increase inflammation. Also note the size of your dog. Bigger dogs, and especially overweight dogs, are putting a lot more stress on the joints than others, which will cause them to be much sorer. So try to make sure you dog is getting the proper nutritional intake to maintain a healthy weight. Wraps – these are technically braces, but function almost like a wrap around the hock or “wrist” area to give extra stability and to help prevent hyperextension. At Flexpet, we’re dog owners and dog lovers too. If your dog has arthritis, let us help. We invite you to try Flexpet absolutely risk free. That means if you don’t feel like Flexpet has helped your dog, simply return the empty bottles and we will give you a complete refund of the purchase price. That applies whether you buy one bottle to test out the product, or buy a three pack to save some extra money. We fully stand behind our product, and want to help you. We’re Convinced You’ll Love It! Our reviews speak for themselves. Customers on Amazon, Facebook, and the direct feedback on our own site consistently show customers happy with the results they’re seeing from Flexpet. That’s why we are so confident you’ll be happy with it, and why we’re confident enough to offer a money back guarantee. The unique combination of ingredients in Flexpet is what causes it to be a leader in joint supplements for pets. It is also the only supplement on the market to contain Cetyl-Myristoleate (CM8 for short), which is clinically proven to help relieve joint pain. Try Flexpet Today Risk Free! So sorry to hear, Joyce! That’s actually exactly why we developed Flexpet (originally for people as “Flexcin” but so many people had hurting dogs and wanted to give that product to them, that we developed an additional formula just to help pets – and that’s Flexpet). Hope it helps! Does Flexpet come in a liquid?. At this time, no, Flexpet is not available in liquid form. I have a 7.5 year old male Rottweiler, he walks and runs just fine. When he is laying down, he struggles to get up. Once he is up he is fine. I’m worried that he might be getting arthritis. Currently I ha e him on Cosequine Ds max strength. He has been on this for 3 years now. It seems as if it had run its course and not as affective as it once was. Is their any side effects tonyour flex pet? Would you recommend this product for my friend Mj? I would love to see him get up as he used to, with no problems. Thanks for your time, Crystal. Hi Crystal. 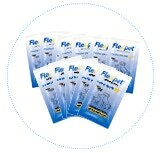 If the pain is related to arthritis, then yes, Flexpet would be a great fit. There are no known side effects, and it does not interact with medication, so you should be safe to go. Of course, you should always consult with your vet before starting any supplement or medication. 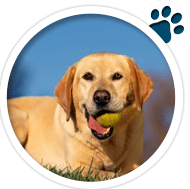 Often what new customers will do is start their pet on Flexpet while on another medication or supplement, and slowly lower the dosage of the other supplement over time. You’ll also want to give Flexpet a good month to kick in and evaluate effectiveness. Usually results are seen in 1-2 weeks, but if you don’t see effects right away, there are cases where it does take a little longer. And, if it ultimately doesn’t work, we’ll refund the purchase price up to three bottles, so we figure you might as well try the full month anyway since it won’t cost you any extra if it doesn’t work. Will the pain come back if I stop giving my dog Flexpet on a daily basis or at all ? It does depend on what is at the root of the pain. If it’s a condition like arthritis, then yes, the pain would come back. It would be just like if a person with arthritis was taking medication (whether it be ibuprofen or a prescription medication), feeling better, then stopped taking the medication. The condition would still be there and pain would still occur as a result. My dashund was diagnosed with arthritis in his neck…would this help…he is screaming in pain. We would absolutely recommend trying Flexpet for a month to help with arthritis. If you do not feel the product has worked after 1-2 months, you can return the empty bottles and we will give you a full refund of the purchase price. Would you suggest flexpet for legs arthritis in bichon? We absolutely recommend Flexpet for arthritis, and for a dog that size (the first dog on Flexpet was our founder’s Pomeranian!). You’ll just need to give a smaller dose, 1-2 tablets daily. Our dog has arthritis in his hips. He is also allergic to a lot of different things, one being chicken and red dye. He can’t have chicken meal or turkey either. What are the ingredients in your product? Hi Heather. Here is a list of the ingredients in Flexpet. If you have any additional questions, please reach out to us at customercare[at]flexcin.com and we’d be glad to help you further! I have a 95lb siberian husky. She is a fully muscular four year old dog. Both her parents were large as well. However, at this young age, she has started showing signs of hip dysplasia. I know if we could get her weight down, it would help a lot, but we are struggling to do that since the food we feed her is a high grade, low calorie food and she only eats 3 cups a day. We currently have her on Meloxicam and Tramadol but they have only shown minimal affect. And they seem to be upsetting her stomach. And I HATE having her on medication. So we are at a loss. Any suggestions? We would absolutely recommend Flexpet for this. It’s all-natural, so there are no drugs involved, and it doesn’t have side effects like stomach issues. Here are some other pages where we’ve talked about dysplasia and Tramadol, as they might be helpful. Also note, that Flexpet has a money back guarantee, so if you want to try it out, there’s no risk to you. Please let us know if you have any further questions! My Shepherd is taking a tumeric paste. Is this still safe to give him if I start him on Flexpet? 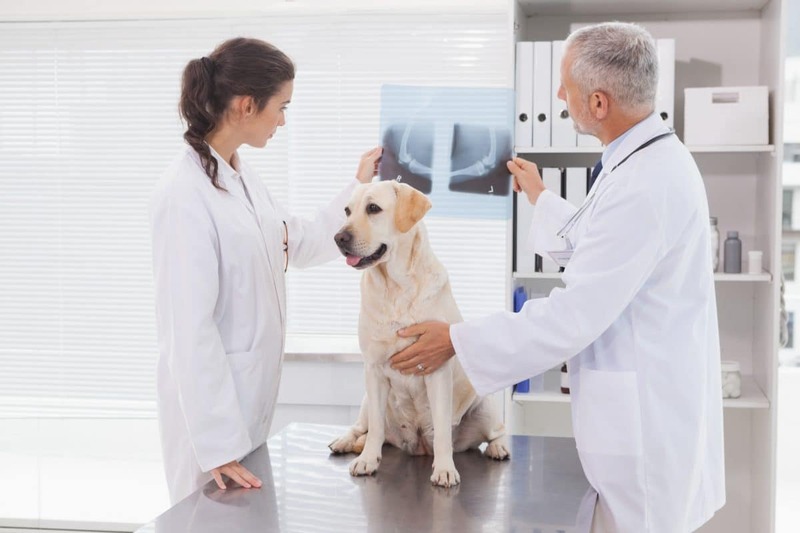 Of course, we need to tell you to consult your vet before changing your dogs diet, medication, or supplements. However, Flexpet is all natural and should not interfere with tumeric paste at all. My dog is 21 years old. Is this safe to give to him with his age? Of course, you should always talk to your vet before starting any new supplements, medications, or diets. With that said, Flexpet is all-natural, and there is nothing in it that would be any more dangerous with age. Of course, keep a close eye on him like you would with any dietary change. But to answer the question, we recommend the same dosage (based on weight) regardless of age. I have a chihuahua that’s about 9-10 years old. She is constantly in pain. She can’t jump on the couch like she used to. She hurts if we try to do anything with her for too long. She used to be a very happy and excited pup. I know her age, she’s obviously calmed down, but I feel so bad when I see her limping and unable to walk without it seeming like such a big ordeal for food. Would this help her out? Hi Jenny! So sorry to hear about the pain she’s going through – we know that’s tough. In short, yes, this is something that Flexpet should absolutely be able to help with. We do have a money-back guarantee if it does not, but this is basically typical case for our customers and what Flexpet was designed for. Feel free to email us directly at [email protected] if you have additional questions. Thanks! Hi Teresa. We’ll reach out to you. Yes, this may be able to help him quite a bit (and if it doesn’t, we have a money-back guarantee). 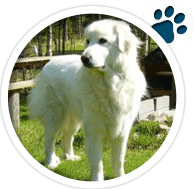 The compound in Flexpet, CM8, is highly effective with arthritis, and actually holds multiple patents for the treatment of arthritis in mammals.